The SETECA Denver Extension site is a partnership between the Central American Theological Seminary (SETECA) and Denver Seminary to offer accredited, college-level courses in Bible, theology and ministry for the Hispanic church. The purpose of the Extension in Denver is to equip pastors, leaders and lay people to serve the God’s purposes in the Church and world. Three programs to help the needs of the Hispanic church in the area of theological education according to the call and goals of each student. This program is designed to provide preparation for pastors and church leaders in essential biblical and theological knowledge and to equip them with foundational tools for their development in Christian ministry. Opens doors to serve in leadership in a Hispanic church or a Hispanic ministry in an American church. University degree that is recognized by the system of higher education in the United States. Opens doors for continued study at other universities (e.g., Bachelor of Arts). Fulfills requirements for ordination or to be sent as a missionary by certain churches. This program is designed to equip students with biblical and theological knowledge critical for Christian ministry that results in the building up of the local church. Preparation for serving in the educational and leadership ministries of the local Church. Growth in biblical knowledge and in one’s relationship with God. Opens doors for further study in other universities. Preparation for those who already have a university degree from a secular university who desire to study at the Master’s level in a seminary. This program is designed for specialized preparation in certain areas of interest with a biblical and theological emphasis. Those who do not hold a GED, High School degree or its equivalent from their country of origin are permitted to study in this program. Greater confidence in sharing with others biblical and theological topics. Foundation for serving in diverse ministries in the local church. April 6, 2019: Beginning of Saturday clases for the II Trimester. April 6, 2019: Deadline to turn in application for entrance into the II Trimester. April 27, 2019: Beginning of Saturday clases for the II Trimester. II Trimester ends June 29. The quickest way to apply is to fill out the Application to Take a Course. To start the application process, follow the steps below. The application can be sent online or by mail. Download the Pastoral Recommendation form and send it to the pastor by email. Your pastor can send the completed Pastoral Recommendation to the following email: . Or the pastor can print out the completed recommendation and send it in the mail to the address of Denver Seminary below. Download and print the application to fill out. Download and print the Pastoral Recommendation form to give to your pastor to fill out. The next steps: once the application is received by the SETECA Extension office, we will be in contact with you to give you information about the admissions interview and paying the admissions fee. What does each program cover? Associate in Biblical Studies: The Associates program covers the main doctrines of the Christian faith as well as the study of the Old Testament and New Testament. The program also provides training in practical areas of ministry such as oral communication, expository preaching, pastoral counseling, Christian leadership, missions and the Christian family among other courses. The curriculum allows the bringing together of knowledge acquired in Bible and Christian theology to be applied in different areas and necessities of the church. Professional Diploma in Biblical Studies: The Professional Diploma covers the starting point for topics such as theology, Old Testament, New Testament and Christian education. Upon completing the degree, the student will be equipped to teach the main doctrines of the Christian faith, while also receiving basic ministry tools that may be utilized for the good of their church. Diploma in Christian Studies: The Diploma in Christian studies covers biblical, theological, and ministry topics according to the the student’s interest. With the knowledge and practice acquired, the student will have the opportunity to apply what they have learned to deepen their relationship with God and to carry out ministry in the church. Are the programs accredited, and which institution confers the degree of each one? The Associates in Biblical Studies and the Diploma in Biblical Studies are accredited through the international accreditation of AETAL, which is recognized by the Association of Theological Schools (ATS) in the United States. The degrees for these two programs are given by SETECA. 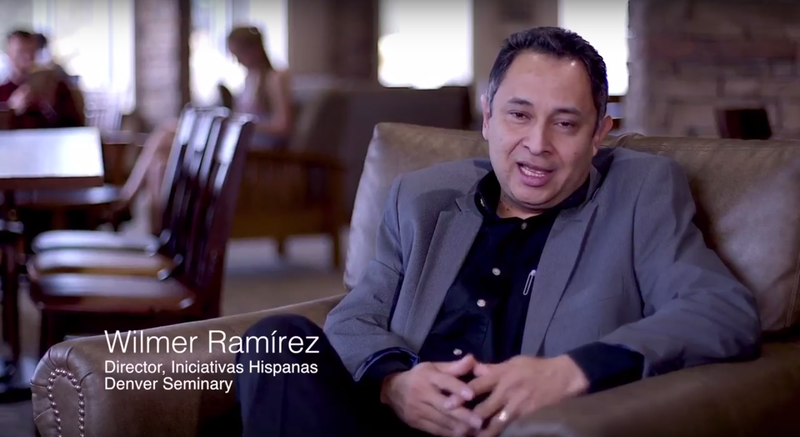 Although the courses that are taken for the Diploma in Christian Studies are accredited by SETECA and can be transferred to the other two programs offered by the Extension or to other institutions, the diploma that is given upon completion is from the Hispanic Initiatives of Denver Seminary (it is not accredited). Still, it is useful for personal and professional development. In what format are classes offered? Hybrid – online work combined with intensive classes for one week: M-F, 6-9 p.m.; Sat. 8 am – 3:30 p.m.
eLearing (online) - no classroom meetings. All readings, homework and interaction in the online platform (Aula Virtual) for the course on the Internet. What are the admissions requirements to study in each of the programs? Associates in Biblical Studies and the Diploma in Biblical Studies: Applicants should complete all of the required documents in the application packet: admissions application, autobiography, pastor’s recommendation, 3 personal recommendations, digital photo, admissions interview and a photocopy of High School diploma, GED or equivalent from their country. Diploma in Christian Studies: Applicants should complete all of the required documentation in the application packet: short admissions application, pastoral recomendation, digital photo, admissions interview and photocopy of High School diploma, GED or equivalent from their country. How is the school year divided up? The school year is divided up into 4 trimesters of 10 weeks each. See the dates of the trimesters in the Information Sheet that can be downloaded from the link. If after studying the Diploma in Christian Studies or the Professional Diploma in Biblical Studies I desire to continue studying at the next level, will the courses I have taken be transferred to that next higher degree program? Yes! As long as you fulfill all of the entrance requirements and complete the application of the program you desire to study, all of the courses you have passed with a final grade of 70 or higher will transfer. I’m not sure I am ready to study in one of the programs. Could I begin by taking one course? Of course! After completing the short application for independent courses, you can enroll in a course by paying for the three credits along with the annual library fee. Students taking independent courses should do all of the coursework. At the end of the course you will receive a final grade. In the future, if you decide to apply for one of the three programs all of the courses that you passed with a grade of 70 or higher will transfer to your desired program of study. Are auditors allowed in the courses? Yes. A person may audit a course by paying $100. Auditors are not required to do any work in the class unless they want to. For this reason, auditors do not receive academic credit for taking the course. The number of auditors in a course and the number of courses a person can audit are limited. A long time has passed since I took formal classes. How do I prepare to return to studying? Given that most who enter the program have not studied formally for a while, new students take preparatory courses that consist of four two-hour sessions with a professor so that they can get up to speed in the following subjects: study habits, reading comprehension, computer skills and writing skills.